Dominic Picinic is the chipleader after Day 1 of the PokerNews Cup at Borgata. The first ever PokerNews Cup on American soil got underway at The Borgata Hotel Casino & Spa on Tuesday. The $2,000-buy-in event drew a total of 120 entries, resulting in a prize pool of $222,324. Dominic Picinic leads. A total of 26 players remain after 16 levels of play, who will all be gunning for the $68,676 first-place prize when play resumes on the final day Wednesday. The event saw an action packed start with Jarrett Blakeley and Scott Sissler all in preflop in the first level. Blakeley had aces and was up against the jacks of Sissler. The latter flopped a jack to go ahead, but the former found a straight on the turn to double up. The action was fast and furious, undoubtedly motivated by the option to reenter if players busted before the ninth level had finished. Right before registration closed, some new players did enter. Ryan Van Sanford, Tim West and Stan Jablonski were just a few that got in at the last minute. After registration closed, action tightened up a bit. John Dolan was one of the first players to bust with no option to give it another go. The former November Niner got it in with aces against Dave Olshan, who had turned a straight. An ace on the river didn't help Dolan and he got up and made his exit. Alex Rocha, winner of last week's Venetian Deepstack $1 million guaranteed event for $173,861, also went down with a big hand. He had ace-king with the ace of clubs on a paired board with four clubs, giving him the nut flush. The dealer had accidentally exposed several cards dealing the turn, giving the players some extra information to work with, but that couldn't save Rocha. It turned out he was beaten by a full house. Familiar names including Ben Keeline, Joey Weissman, Matt Stout, Jeremy Ausmus, Kevin Saul, Mukul Pahuja and Shannon Shorr all gave the PokerNews Cup a try, but failed to survive the first day. Of the 26 players who did make it through, Dominic Picinic is leading the charge. 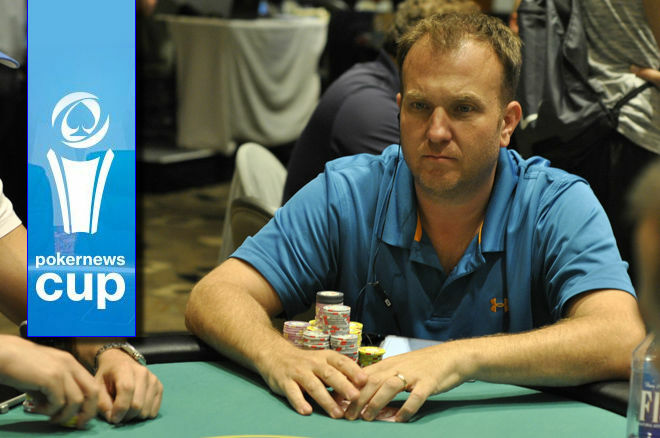 Picinic turned his 30,000-chip starting stack into 323,500. His closest competitor is Jason Deutsch with 273,500 in chips. Jake Bazeley (235,000), Christian Harder (150,000), Ryan Van Sanford (116,000), Aaron Massey (78,500) and Mike Dentale (53,000) are also among some of the others who will return for Day 2. Play resumes at 12 p.m. local time with level 17 (2,500/5,000, 500-ante). A total of 18 players will make it to the money.